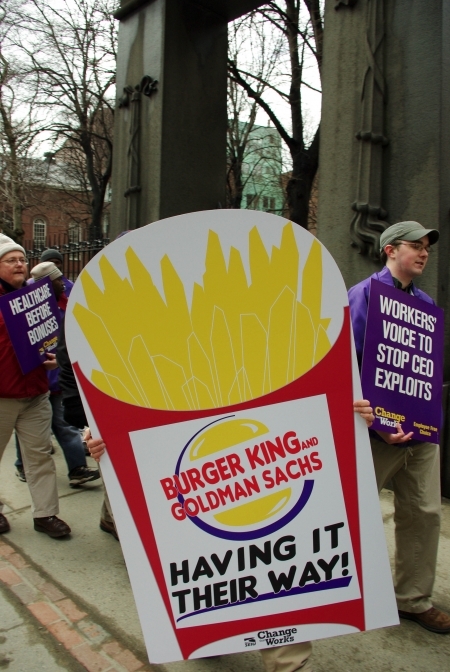 BOSTON/Downtown Crossing - Over 50 people from the Service Employees International Union and allied organizations held a picket at 2 downtown Burger King locations Thursday. The event was the latest in a series of "Enemies of Change" protests organized nationwide by SEIU in an attempt to stop major corporations from lobbying against the Employee Free Choice Act - which is up for a vote in Congress later this year. If passed the EFCA will allow Americans the right to form unions if they turn in signed union cards to the National Labor Relations Board for a majority of workers in their workplace - bypassing the traditional union election system that unions say is very easy for employers to short circuit through means foul and fair. Once recognized, the new unions will still have to negotiate contracts with their employers and get them enforced. The union chose Burger King as a protest target because it's a low-wage employer with large numbers of workers that spent $319,000 between 2006 and 2008 to fight passage of the EFCA. In addition, it is owned by Goldman Sachs - the financial giant which recently received economic bailout money from the U.S. government. The union believes the bailout money should have gone to working Americans, and not to one of the institutions they blame for the economic crisis. SEIU regional director Harris Grumman explained, "This is another one of our series of "Enemies of Change" actions to focus attention on who's fighting the change people voted for back on November 4th. We're really working hard for the Employee Free Choice Act; so that people have the right to organize at their workplace to have better wages and benefits. And there's no worse case than Burger King - which is also partly owned by Goldman Sachs, and Goldman Sachs is one of the big bailout recipients. They got 10 billion in taxpayer money and they gave 6 and a half billion of that as bonuses to their CEO and executives. "That amount of money, that 6 and a half billion, would have given every Burger King worker in the country an $18,000 bonus this year," Grumman continued. "Which is more than twice as much as they earn in a year. So we're just saying you're using this money to give yourself bonuses, you're using this money to fight the Employee Free Choice Act, you're fighting the rights of your workers to have better wages and benefits, and you're using the taxpayer money to make your profits. It's wrong wrong wrong all down the line. We're shining a light on that, and we want to make sure that this new administration and new Congress take action on it." 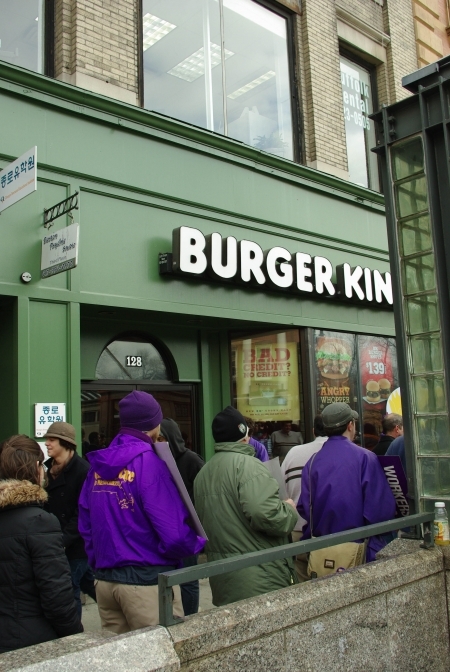 Union members and staff entered both the 128 Tremont St. and 1 Center Plaza Burger King stores and leafletted customers and Burger King workers until management ordered them - and members of the press - to leave the premises. They held a short march between the first and second stores - from Park St. Station and Government Center. Moving pickets were maintained outside both stores while leafletting proceed inside and outside the stores. A short rally was held outside the first store with speakers from the Greater Boston Central Labor Council and SEIU Local 615. There was a light police presence and no arrests. Management at the 1 Center Plaza Burger King store did begin to get a bit physical in their attempt to eject activists and this reporter, but Boston Police officers cleared the store with no further incidents. Grumann indicated that SEIU's EFCA campaign was just getting in gear. "We're going to keep the pressure up on Goldman Sachs and Burger King, and we're going to also take this to other Enemies of Change like FedEx, Home Depot, WalMart and others. We already saw McDonalds back down and say we do not want to fight the Employee Free Choice Act; so our action at McDonald's ended their opposition to workers having democratic rights. So these actions do pay off. They're across the country. It's not the kind of publicity they want. They know they have a working class clientele. And they can't afford to turn them off. " Burger King Corporation has not yet responded to a request for comment about the protest from Open Media Boston. 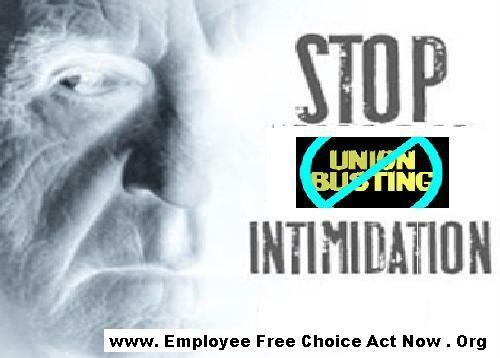 Who is in this Employee Free Choice Act Union Busting Club?